It's that point in the Christmas season when you begin to freak out over all of the presents you have yet to get for your loved ones. I'm putting this guide together to give you guys some ideas for your friends and family. Whether you are crafty, preppy, practical, sporty or looking for a one stop purchase I have plenty of ideas for you. 1: The Love to Bake Kit- The perfect gift for anyone that loves making desserts. Fill a jar with cupcake liners, cookie cutters, and fun sprinkles to create an all inclusive baking gift. 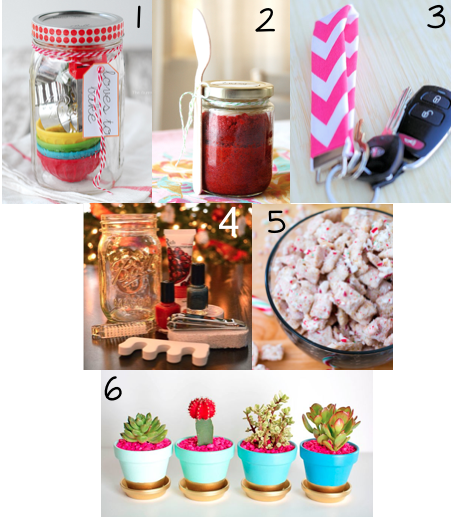 2: A Delicious Cupcake in a Jar- Make your favorite type of cupcake decorated with fun frosting and holiday sprinkles, put it in a mason jar and attach a printed spoon as a cute simple gift. 3: DIY Key Fob- Any teenager loves a cute key fob to decorate their key chain, this is a supper simple tutorial that makes a simple but useful gift. 4: Pedicure Kit- Put some festive holiday nail polishes from OPI or Essie, add a mini nailpolish remover bottle, nail clippers, and lotion. This is a great relaxing gift for women and girls alike. 5: Peppermint Puppy Chow- Make some holiday puppy chow and put it in a clear bag with some holiday ribbon for a simple yet delicious gift. You can even add a giftcard to their favorite store attached on the outside. 6: Gold Dipped Flower Pot- Paint a pot in a fun color with a gold accent and add a pretty plant for a fun and dfifferent gift that appeals to nature. 1: J. Crew Factory Flannel Pajama Pants- A fun printed pair of pajamas is always a fun gift, paired with a fun tee and you have a simple, but put together outfit. 2: Kate Spade I Pad Case- Every preppy girl loves Kate Spade and a great way to show it off is a fun printed case for their I Pad. This is an easy gift that is perfectly complete. 3: Lilly Pulitzer Wristlet- Pick up a fun wristlet and add a gift card for your loved one's favorite store inside to create a great gift. 4: Southern Tide 1/4 Zip- A cute gift for your favorite preppy boy; a fun pullover to pair with their favorite oxfords and tees. 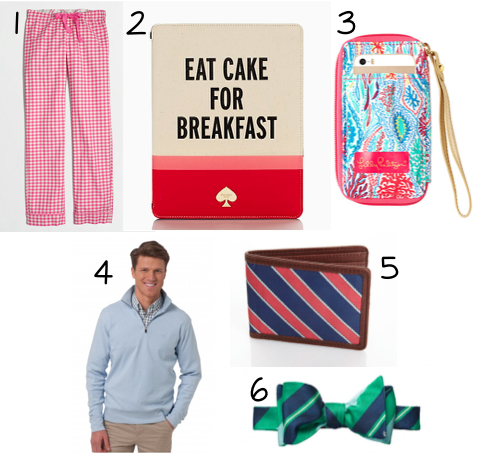 5: Vineyard Vines Wallet- Every guy needs a good wallet; you can add a giftcard to it as well to complete the entire gift. 6: Southern Proper Bowe tie- This is a cute tie for your beau and makes a great easy gift and add a cute matching shirt to create a complete look for your favorite boy. 1: Cologne- Everyone uses perfume or cologne, but they never want to buy it for themselves. Treat your loved one to a new scent or an old favorite and you can't go wrong. 2: Mophie Rechargable Phone Case- A rechargable case is great for an guy to allow them to never run out of battery with a convenient sleek case. It's a simple, but much needed gift. 3: Maglite LED Flashlight- Guys love flashlights, it's a known fact. Get them the newest in LED flashlights to put a smile on your favorite guys face Christmas morning. 4: J. Crew Camp Socks- Girls love socks and J.Crew camp socks are the perfect mix of functionality and style. With many different colors to choose from their great for girls to style this winter. 5: Kate Spade Journals- A cute notebook paired with some cute pencils or pens creates a much needed gift. For moms, students, or neighbors alike all have notes and reminders to jot down. 6: Lilly Pulitzer Portable Charger- This cute charger will allow any girl to keep her phone charged in style, choose her favorite print and give her a gift she will use daily. 1: Fit Bit Flex- I have a fitbit and love it; it is a unique item that helps you keep up with all things fitness in a unique wristband. 2: Krass and Co Shorts- Krass and Co shorts are so cute with their unique fun prints, so pick up a pair for your favorite guy and maybe a fun tshirt to go with it. 3: Wake Forest Shirt- Guys love shirts for their favorite team, so find a cute one with their team's logo. This is my personal pick for my dad. You can even add a hat or croakie to go along with it. 4: Personalized Water Bottle- A personalized water bottle is a great gift, just get a water bottle and add a sticker with their name or initials and fill it with delicious treats. 5: Nike Running Shoes- Running shoes are great, because girls and guys love to have many different colors to go with different outfits. 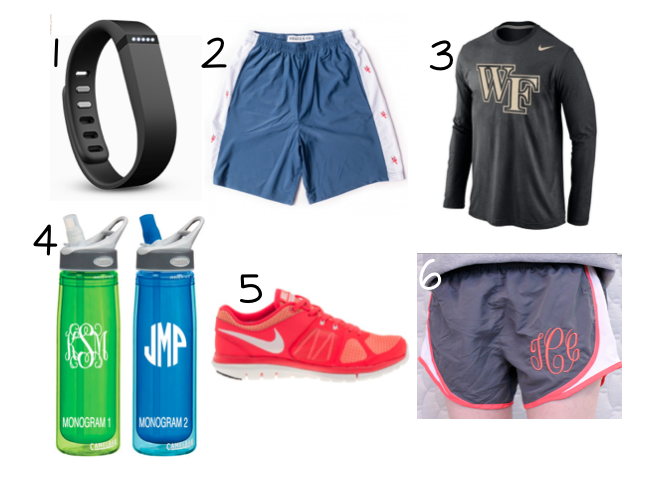 6: Monogram Shorts- Pick up some Nike running shorts at the store and drop them off at the local embroidery shop for a cute and personalized gift for the runner or athlete in your family. 1: J. Crew Tweed Sport Coat- A cute blazer or coat is a great gift for any guy plus your boy will look super cute this winter! Plus this tweed J.Crew coat is fabulous. 2: Hugo Boss Watch- Most guys don't have a nice watch, so when looking for a one stop present a watch is a wonderful present for him. 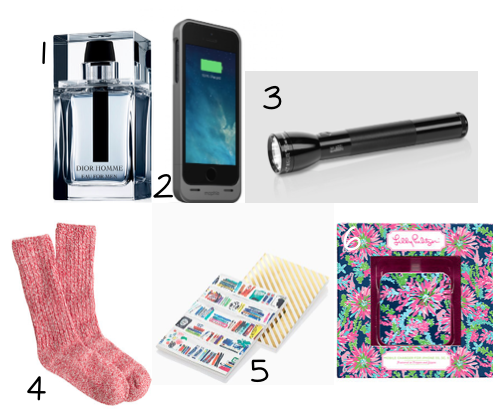 3: I Phone 6- Who doesn't want the newest I Phone, so this is a great gift for your loved one. You can even inculde an Itunes gift card, so that they can get some new songs with their phone. 4: Large Longchamp Le Pliage Tote- Longchamps are the perfect totes to carry around to school, airport, or day to day. Any girl would love one, because of its simple and classic style. 5: Tory Burch Robinson Wallet- A new classic wallet is a great addition for any girl and most girls love Tory Burch. This is a great item any girl would be excited to receive. 6: Salvatore Ferragamo Flats- These flats would make a great addition to any girls closet. 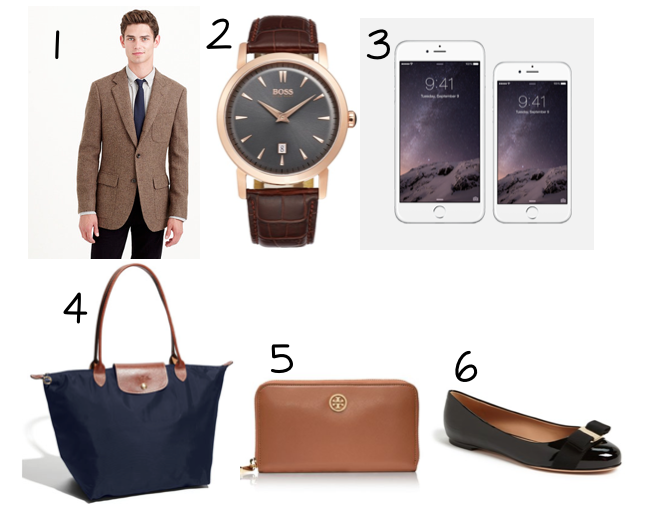 Their simple nature makes them extremely easy to style. I hope you guys got all the idea you needed and have a wonderful holiday season!